Donegal and the Blues opened proceedings at the Irish Cultural Center on Sunday with Donegal coming out with a convincing win. The northerners never looked in any danger, but for their part the Blues fought hard throughout what was a losing battle. Christy McLaughlin smoothly curls it over. Donegal rattled the net 3 times inside the first 30 minutes with goals from Christy McLaughlin (2) and Aidan McLaughlin. But for the post there would have been one or two more as on a couple of occasions a goal seemed on the cards only for the post to deny the would-be scorer. Donegal looked dangerous going forward. With Ciaran McDevitt, Darren Grant, and Aidan McLaughlin bursting through on several occasions, the Blues defence were up against it. The Blues experienced a good spell in the middle of the period. Mike Ralston at corner forward popped over a couple of well-earned frees, while Pat Murray and Michael Moylan carried the ball forward well. Richard Howley also pointed, but for the most part it was Donegal on top and with a 3-7 to 0-4 half time lead. Donegal continued to hold the upper hand for the second half. Tired legs took their toll and for the Blues led to tired passes. 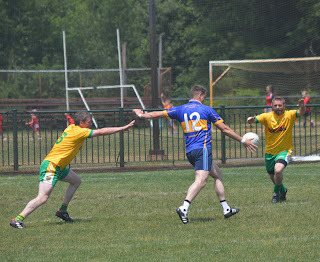 More Donegal scores came from McDevitt, Ronan Diver, Christy McLaughlin and Rocky Ivers as the Tir Chonaill men stretched their lead. The Blues kept at it and were rewarded with scores from Ralston and James Feeney. Donegal added more to their tally through Grant and McLaughlin, and in the end came out easy winners. James Feeney has a go for the Blues. Blues: Conor Fitzgerald, Shane Kelly, Liam Bradley, Brian Fannon, John Craig, Pat Moriarty, Pat Murray, James Feeney, Brian Kennedy, Michael Moylan, Brian Griffin, Richard Howley, Mike Ralston. Donegal: Lee McCarron, Declan McBride, Paul McNulty, Darren Doherty, Neil McEneaney, Sean Winston, Darren Grant, Mark Dunphy, Ciaran McDevitt, Rocky Ivers, Aidan McLaughlin, Christy McLaughlin, Conor Brennan.